Growing blackberries in container is very simple! We love fruits of all kinds. However, in our eyes, the growing space is limited. In order to create space, we have made our back garden into a half container garden in the year 2013. A Raspberry plant would be interesting; however; we preferred a thorn-less blackberry. We have selected an almost bare; 42cm tall (excluding roots) blackberry, Rubus fruticosus 'Thorn-less Evergreen' (Braam in Dutch) plant on 16 November 2013 (above picture 1). The moment you discovered a baby Lady beetle was born between the leaves (picture 6), you knew that you need to be more alert of the Aphids. A new shoot was extended to the right; when the whole cluster of green berries were completed on 17 June (day 213). The side shoot on the right has expanded to 235cm (above ground) from 13-28 July and climbing up, so it was time to decide how you wish it to be attached to the trellis (picture 19&20). On 1 August harvested the second and the third berry (picture 24). I truly enjoy seeing the contrast of one whole totally red cluster of berries (picture 25); with another cluster of red and black mix (picture 23). Damages started with the birds on 4 August (picture 26&27) and followed by the Aphid insects (picture 28). otherwise the bottom of the fruits may not be able to be ripen. If the growing environment is essential, the berries could expand into a better size (picture 30); and to be ripen in time. they will eventually returned to red colour (picture 35). Unripe berries are supper sour! If the rain fall is too often the berries will be taste-less; just like strawberries. The last totally black cluster of berries were hanging on the vine (picture 33&34), on 15 Aug 2014 (the day 272). You can accumulate and freeze the blackberries in a tightly sealed container; if you are not using them right away (picture 36). and the leaves were in deep red on 3 November 2014, the day 352 (picture 38). 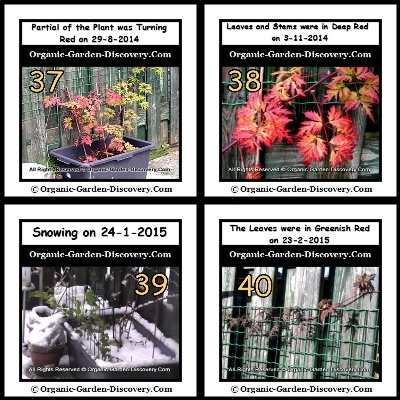 Snow covered the whole container (picture 39) for several times during the winter season, and the leaves on the trellis were still in greenish red (picture 40). 11. You can see the plant need not much space (above picture 41) to develop further; if you put it in a container. 12. You can spray water on the pockets (picture 43) of the old shoots even you see them dry like a cane. They might surprised you. 13. The plant is growing one new shoot every year (picture 42&44) in the mid-spring. And you have to re-arrange all the shoots to give it rooms to develop; once it appeared. Growing blackberries for your next ice cream toppings?